Make Scrapbooks, NOT dinner. : Look, Mom! I won. Treyton was being creative today at our Breakfast Nook table when he held his paper up and said, "Look, Mom. I'm the X's. I won." 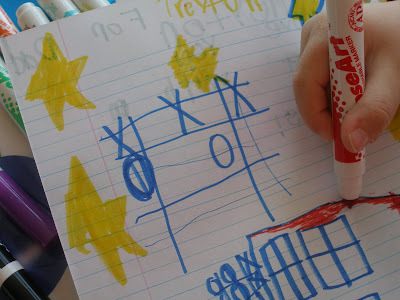 What he had done was become the x's and the o's in a Tic-Tac-Toe game that he had drawn and played as a one man team. He was dealt a situation - a simple game. Somewhere in his mind he decided that he was going to be the X's and that he was going to win. He could have just as easily been the O's and I think that he would have still chosen to win the game. So...when I am dealt a situation, either good or bad, I need to choose what I'm going to be (X's or O's) and then win it. Just that simple. Excuse my ramblings...they may mean nothing to you, but I was struck down by it. I got something from it and maybe you will too. Very good...I will try to remember that, too! Thanks for posting your thoughts! Isn't it amazing how our children have a way of simplifing(sp?) things for us? We all could use more of their determination and innocence!